1. Preheat oven 350°F. Spray a 24-cup mini muffin tin with baking spray and set aside. 2. In a medium bowl, whisk together flour, baking powder, salt, cinnamon, nutmeg, allspice, and cloves. In a separate, large bowl whisk together oil, brown sugar, egg, vanilla, pumpkin and milk until smooth. Add dry ingredients to wet ingredients and mix until just combined. 3. Divide batter evenly among muffin cups. Bake for 10-12 minutes or until a toothpick comes out clean. 4. While the muffins bake, melt butter in one bowl and combine granulated sugar and cinnamon in another bowl. Remove muffins from oven and cool for 2 minutes. 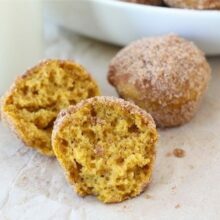 Dip each muffin in melted butter, then roll in cinnamon sugar to coat. Serve muffins warm or at room temperature. There are perfect for fall!! Can't wait to make them!